What a relief to leave the oven that Phoenix is and head north to Flagstaff. 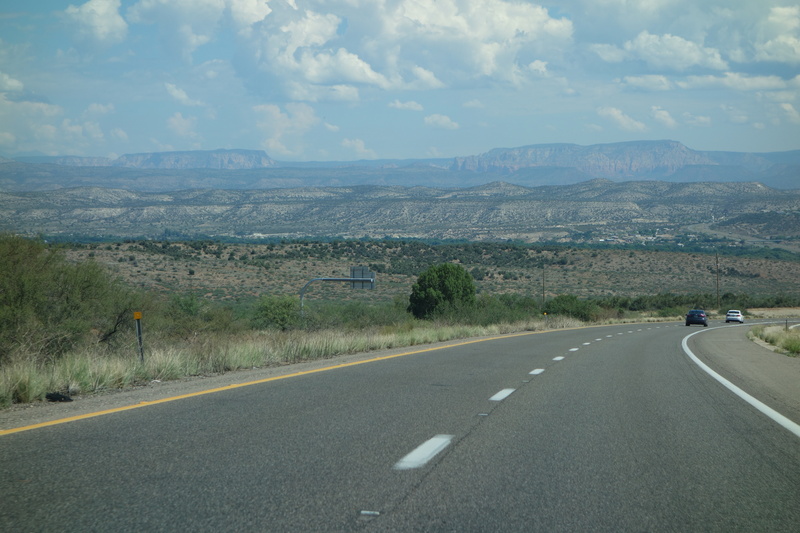 Whenever I drive this road, I forget how beautiful the view is from the summit around the turn-off for Sedona. The temperature plummeted. After a short rest at my family’s house south of Flag, we attended a wine dinner at Tinderbox, a very good restaurant in the city center. All the BBQ ribs and brisket I ate over the past month were nothing compared to the cold corn soup ladled over a piece of smoked butterfish and a scallop; the pea-shoot and arugula salad with beets and blue cheese; the mushroom and duck confit risotto with crispy thin onion rings; the thick slices of balsamic-fennel crusted lamb sirloin, roasted broccolini, and pan-sauteed new potatoes. Stop! Mercy! we fifty diners cried. Kevin Heinonen, owner, and his cousin, Scott Heinonen, the chef, really have something special here. I’ll never forget the fried housemade-baloney sandwich I ate there three years ago. The Jersey girl in me was in heaven. Tehachapi on Saturday, home on Sunday.